Cross and Cutlass: The time of your captivity has come to a close! The time of your captivity has come to a close! I love the Old Testament. Far too many churches these days ignore the richness of the Old Testament and only focus on the New. Or they only concentrate on those stories that are really cool, or those stories that show God in a favorable light, like the parting of the Red Sea, Joshua and the fall of Jericho, Daniel in the Lion's Den, etc.. I've heard many people say that the God of the Old Testament seems like a real gruff meany compared to Jesus in the New. But we are told God never changes, so how can that be? The Bible is one of those books that you can't just take a verse out here and a verse out there and hope to understand it. (Or the God who wrote it) That's why so many Christians who only hear one sermon a week and who never crack their Bible, never really learn to know God. Yes, some of the Old Testament is very hard to swallow. Stories where God opens up the earth and swallows up thousands of people, or where He wipes out thousands with a plague or where He orders an entire family killed for the father's sins. These stories tend to scare us into picturing God as a bully in the sky and if don't behave, He'll zap us. Nothing could be further from the truth! I've read the entire Old Testament probably close to 20 or so times now. And you know what I hear in it's pages, through it's stories? I hear the groaning and pleading of the broken heart of a Father who loves His wayward children so much, He would do anything to save them. Time and time again, God extends His hand of love and blessing to His children, and time and time again, they reject Him and go their own way. It would be like you as a parent telling your kids to stay away from drugs or driving while drinking because you know they will get hurt, but they snub their noses at you and don't listen and run off and do drugs and end up sick and miserable. So, you do what any parent would do, you punish, you restrict, you try everything to get their attention and get them back on the right track. When the Israelites would rebel against God, He would wait years.. hundreds of years sometimes, trying to plead with them to come back to Him. His patience and love are astounding!! Then finally, He had to punish them. There was no other way to get their attention, so He would allow some other nation to come conquer them and take them captive. But like any punishment, it wouldn't last forever. God ALWAYS redeems His people. Verse after verse and chapter after chapter in the Old Testament show God's comfort and mercy and His promises to save and restore His people. So, why do I tell you this? Because God is the same yesterday, today, and tomorrow. He deals with us the same way. When we rebel against Him, He punishes us. But it is only for a time. When that season is over, if we have learned, He restores us. Let me get personal here. I spent 35 years rebelling against God. The consequences I suffered for that are still on going. I face my own captivity every single day. I suffer from it every single day. And I deserve it and much worse. But in my quiet time with God lately, I heard Him distinctly say that the time of my captivity is coming to a close. Then the next day I came across the verse listed above, which only confirmed what I'd already heard. Maybe you are still suffering the consequences of your rebellion. Maybe you've resigned yourself to it (A bad marriage, wayward kids, health problems, money problems) Maybe you think you deserve it and more. But you love God. You've learned your lesson and you're growing closer to Him. God is saying to you. There is an end to your captivity. 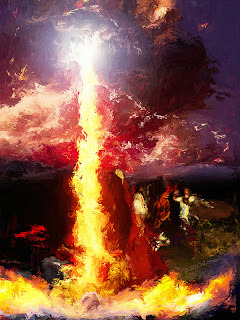 Just like with the Israelites, He will not leave you in Babylon forever. Excellent word today, once again ! I for one, am SO extremely thankful for God's -- great and patient love toward His children !!! I am SO extremely thankful, that He is a loving Father, that He cares and forgives, and continues to hold us. 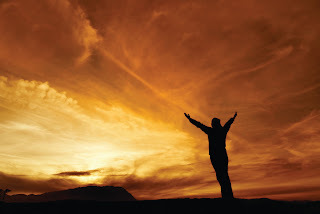 Thank the Lord, that there will be an end to my/our captivity (from many previous bad/wrong choices made in life) ! And by the way ... 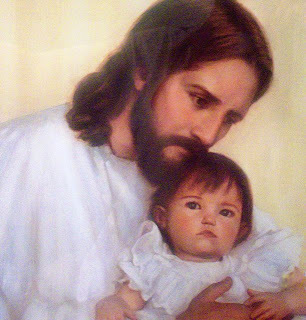 I love the picture of Jesus holding/loving the little child !!! How precious! "Amazing love, how can it be ... that He would love/save a wretch like me." Thanks for another timely Word in due season. MaryLu, thanks again for a wonderful post. I'm SO thankful that my Father loves me the way He does and forgives me when I mess up. I certainly don't deserve it. Like you, I love reading the Old Testament and really enjoy when our church does a study from it. Thanks for stopping by, Ladies! Love that song, too, Brenda.. but my all time favorite old hymn is Amazing Grace.. it totally describes my situation!! Anyway, God is sooo good. So filled with love and mercy for us. All we need to do is turn His way. He even reduces the consequences we create from our own bad choices. Amazing, indeed. I am another who stands amazed and in awe of God and the love and mercy he has shown us, His banished children! I know how wretched and unworthy I am, and yet, I am still forgiven! I am forgiven through the blood of Christ, our redeemer. We all pay a price, in this life, from sin. The very earth we live on suffers the consequences of sin. I look forward to the day when sin is gone, and we will no longer suffer. I personally enjoy reading the Old Testament. There is so much more in there that I was ever taught in Sunday School and church services. Each time I read through the Bible, God shows me something new! I believe that people see God as much meaner than Jesus because in the Old Testament, God spoke through people. Those people could be quite 'loud' at times and went a bit overboard when relaying God's message, putting in their own dramatic flair. In the New Testament, Jesus spoke for himself and in a loving way. Even when He would admonish someone, He did it in a respectful way. Emma, you and me both.. can't wait for that day when the suffering ends!! Chaplain, I never looked at it that way.. about how the people God used to speak for Him in the Old Testament were sometimes loud and obnoxious. Good point. Jesus showed us who God truly is--the best Father any of us could ever have!